Bobby Parnell came on in the ninth inning yesterday with a 4-3 lead after the Mets put up four runs in the bottom of the eighth. A leadoff error by David Wright led to two unearned runs and a crushing 5-4 loss. It was the third blown save this month in seven games for Parnell. By contrast, Francisco Rodriguez was 26-for-29 in save opportunities before being dealt to the Brewers. Rodriguez was an established closer while Parnell is getting on-the-job training so perhaps it’s not fair to compare the two players in this regard. What is fair is to ask if the Mets are expecting too much from their young fireballing reliever. When Rodriguez left, Jason Isringhausen was used as the closer until he recorded his 300th career save in the third week of August. Then Parnell took over the role. 8/24 – Started ninth inning with 3-run lead and picked up the save. 8/29 (G1) – Started ninth inning with 2-run lead. Allowed a run but picked up the save. 8/31 – Started ninth inning with a 1-run lead and picked up the save. 9/1 – Entered with two outs and a three-run lead, allowed inherited runner to score but picked up save. 9/4 – Started ninth with 3-run lead and picked up the save. 9/6 – Started ninth with 2-run lead, allowed two runs and picked up a blown save. 9/10 – Stared ninth with 1-run lead, allowed two unearned runs for blown save and loss. When Parnell entered the game with a 3-run lead, he is 3-for-3 in save opportunities. When he enters with a 2-run lead, he’s 1-for-2 in save opportunities. When he enters with a 1-run lead, he’s 1-for-3 in save opportunities with two losses. For whatever reason – and you can certainly say small sample size – Parnell’s struggles have increased in direct proportion to how difficult the save chance is. In hindsight, perhaps Parnell should have been given the chance to get some 3-run saves under his belt before taking over the full-time responsibilities of closer. Maybe more of an extended breaking-in process in the closer’s role would have been beneficial. However, that is pure speculation. Instead, let’s look for a more objective view of Parnell’s season. Because he throws 100 mph, Parnell seems like a closer waiting to happen. But results matter more than pure velocity and for the most part what Parnell has achieved in 2011 is right in line with what we should expect given his history in the majors. Coming into the year, Parnell had 128.1 IP in the majors, with all but five of those coming in the 2009-10 seasons. So far in 2011, he has 51.1 IP or a little less than half of what he had done previously. Let’s compare what Parnell has done this year versus what his career numbers are, to see if he is significantly under or over-achieving in any category. There’s virtually no category where you could say Parnell was underperforming this year. His walks are up a non-trivial amount from his career average but that has more to do with an outlier performance last year in the category, where he allowed 2.06 BB/9. 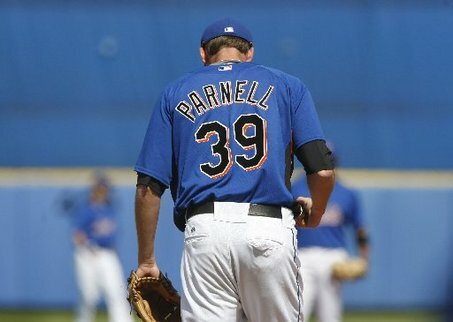 In the minor leagues, Parnell has a career 3.9 BB/9 and in his time in the majors excluding 2010, he has a 4.54 BB/9. His HR/FB rate is up but still comfortably below what we consider normal in the category. The one thing that does jump out is his strikeout rate but his performance in 2011 is better than what we would normally expect. However, I don’t think we should be too surprised that a young pitcher who lights up the radar gun has a high K/9 rate. Essentially, Parnell in 2011 is exactly who we (and by that I mean anyone who examines his career record in the majors) thought he was. Yes, he throws really hard and strikes out a bunch of guys. But he also has poor control and is very hittable when batters make contact. One thing that is disturbing is that 2011 is shaping up as the third straight year where Parnell has posted an ERA higher than his FIP or xFIP. For a comparison, Mariano Rivera has had an ERA below the estimators in nine of the 10 years for which we have data and the year where he didn’t, his ERA was 3.15 compared to a 2.92 xFIP. Again, perhaps it’s not fair to compare Parnell to the greatest short-inning reliever in history. Instead, let’s compare him to another hard thrower – Kyle Farnsworth. Much like Parnell, Farnsworth is another guy who lights up the radar gun and is a player that everyone looks at like a guy born to be a closer. Five times in his career his average fastball velocity was at 96 or above. Farnsworth posted an ERA lower than his estimators just one time in the first eight years for which we have data. However, Farnsworth’s ERA was 3.34 last year compared to a 3.49 xFIP and so far this year he has a 2.32 ERA and a 3.27 xFIP. At age 35, Farnsworth has finally reached the 20-save plateau in his career in 2011. Yes, ERA and Saves are not the best ways to measure a reliever. But we already looked at Parnell’s peripherals earlier. Either way, the result is the same. No matter how much we may want Parnell to be a closer, his overall body of work suggests he’s not good enough for the role right now. At 26, Parnell still has plenty of time to grow into being a solid closer. But we should expect the transition to take quite some time, perhaps even years. Everyone wants a shut-down closer, one guy who can come in and record a 40-save season. But assuming the Mets don’t spend money on a free agent closer in the offseason, which certainly seems like a logical assumption, then perhaps the best thing for the 2012 Mets would be to have co-closers. Isringhausen is mulling a return for 2012 and if he does come back then he would seem to be an ideal guy to share closing duties with Parnell. Isringhausen gets the 1 and 2-run saves while Parnell gets the 3-run saves and whatever other save opportunities arise on days when Isringhausen is unavailable. This plan puts Parnell in the best position to succeed. And from what we saw of Isringhausen this year, he either has it or he doesn’t – so it should make little difference to him that he ends up with the toughest of the save opportunities. An Isringhausen-Parnell closer combo is far from ideal, but it may be the best thing for the cash-strapped Mets, in addition to being the best thing for Parnell. I’m not sure why Parnell was bequeathed the closer role, as you point out, he does not have closer numbers. Neither does anyone else on the roster. It is also apparent there is no money to pay a closer. I’d bring in 3-4 new relievers in 2012 instead of one closer, and rotate the best three through the final innings. Hopefully, one will rise to the role, but if not, they will have at least some options in quantity. What you say makes sense but whenever a team tries to go into the season without an established closer – they get crucified when it doesn’t work out. SPOT FOOLING AROUND. GO OUT AND GET A GOOD CLOSER. stop using PARNELL AS A CLOSER. TRY 7 OR 8 TH INNING’S.